NEWS FLASH! My wayback is back! Let me first say that the Internet Archive is one of the most important, impressive crowning achievements we have for preserving and understanding what is truly a transient information space. And I rely regularly on the WayBack Machine to research, discover, and fall into interesting rabbit holes. And let me add, that I am most likely not understanding enough here, but I am rather worried about what I have discovered about what you can find in the archive for sites you contributed to in the past do not manage in the present. Apparently it hinges totally on access to text file sitting on the current domain. As alluded to recently, it makes for a fragile archive. Allow me to play this back. I was responsible for maybe 10 Gb of early web stuff in my position from 1992-2006 as an instructional technologist for the Maricopa Center for Learning & Instruction (MCLI) at the Maricopa Community Colleges. I am not 100% sure, but the MCLI web site might have been up before Maricopa had one. I wrote a very early HTML tutorial that was my first “break” in online space (archived myself at http://mcli.cogdogblog.com/tut). Active in the mid 1990s in multimedia, I built Director Web, the leading resource for Macromedia Director, before Macromedia as a company had a web site. All my old stuff was gone; I understand because a lot of it was built on perl scripts doing things like writing information to open text files. It was a mess. But the re-assuring thing was that all my old stuff was findable with the Wayback machine. The folks at Maricopa did set up a forwarding DNS entry so all traffic from the old domain http://www.mcli.dist.maricopa.edu/ at least ended up at 404 message on the new one. “Page Cannot be displayed due to robots.txt” If you do not know of robots.txt, learn about it now. It’s a plain text file where web site owners can tell web crawling robots (the things that make search engines work) to either come inside, or to stay away. It’s a way for owners to not have their site indexed if (a) they prefer not to be or (b) to reduce repeated traffic on their servers. But this is not an issue with the robots.txt file at Maricopa. The problem is robots.txt cannot be found, because the DNS entry for the old URL is broken, http://www.mcli.dist.maricopa.edu/ will not connect to anything, and so http://www.mcli.dist.maricopa.edu/robots.txt is never found. I emailed the internet archive and did get a confirmation that if the Wayback Machine cannot find a robots.txt file, it removes the archive. Or, unless the current domain for an archive says “Internet Archive, please archive me” it won’t. The default is not to archive. If this is true, than many old sites must be disappearing or never added to the Internet Archive because there is no active robots.txt file at the current (cue domain squatters, or in my case, a IT department’s good in a DNS entry). Should not an archive reflect the robots.txt policy at the time of archiving, not retroactively from the present? I am hardly the first to trip on this, there are many threads like this in the Internet Archive’s forums. An explicit exclusion is one thing. But, in my case, what is happening is a lack of an inclusion, not an explicit exclusion. This is quite different. The Wayback Machine’s policy is saying, “If we cannot locate a robots.txt file, we remove an archive”. According to their A for the FAQ Why isn’t the site I’m looking for in the archive? Some sites may not be included because the automated crawlers were unaware of their existence at the time of the crawl. It’s also possible that some sites were not archived because they were password protected, blocked by robots.txt, or otherwise inaccessible to our automated systems. Site owners might have also requested that their sites be excluded from the Wayback Machine. None of these apply to http://www.mcli.dist.maricopa.edu/. I fully expect there is something at play I do not understand. I don;t know who to contact at Maricopa; I sent a message with subject “Technical Question for ITS” to the general email for questions, but heard nothing. Please direct this request to the ITS department. I worked at District Office 1992-2006 for MCLI; all of the web sites I worked on have been retired, but because they were some of the earliest educational content on the web, thousands of external sites still link to them. In the past, these old sites were reachable via the Internet Archive, but now the archive for the original MCLI web site has vanished. 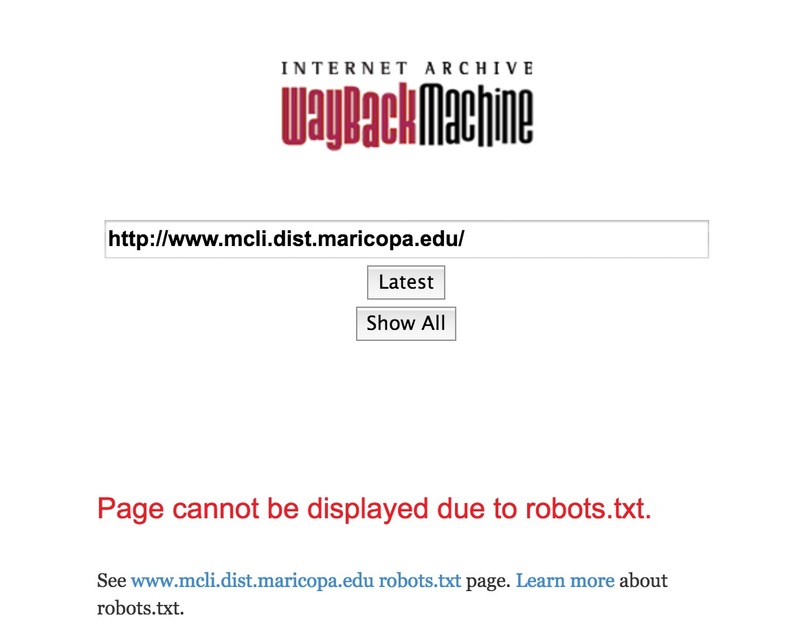 This is because the old URL http://www.mcli.dist.maricopa.edu no longer forwards correctly to the new site http://mcli.maricopa.edu (it never connects) — If the Internet Archive cannot locate the robots.txt file it removes archived web sites. All it would take to fix is a correction to a DNS record. I am sure this is of lowest possible importance, but I’d appreciate consideration. I doubt that a bunch of old web sites from the 1990s are on anybody’s list of important stuff to do. I’d hate to have to directly contact the Maricopa CIO, whom I worked with when I was there, to do something as mundane as fix a broken DSN entry. But archives and history are important! Especially when they are something you had a part in. And if the default is Not Archive, then the archive is in trouble especially for old web sites. Tell me where I have missed something. UPDATE JULY 5, 2016… Back in the Wayback! We found, and addressed, a condition that was causing playback of some sites to be unintentially blocked under certain conditions. Thanks Mark for the followup. If you believe in the open internet and it’s sustainability, then line up with me to donate to the Internet Archive — if they are not archiving it, nobody will. Ah, but because these are in flickr, I can locate adjacent photos that tell me where it was- this was late June, 2009, on a hike in Oahu with my friend Bert Kimura. So, you’ve inspired me to start looking at what of my own stuff is accessible through Wayback. Turns out that searching for http://merelearning.ca nets an identical error to yours above. ‘No access because robots.’ hmmm…as far as I can see, my site shouldn’t be in the same category as your old stuff at Maricopa. Am I missing something? Do I need to do something to submit my stuff to Wayback? I cannot answer definitively because I’ve not heard back from the person at the Internet Archive as to the reason for my old site’s disappearance. My hunch is, from looking over the FAQs, is that the best bet is to make sure the robots.txt file on your server explicitly allows crawlers, or at least their crawler. While there is a place on the site to submit a single URL, the site wide crawl is driven by the Alexa services. This makes me very angry. robots.txt was never a required file, it was only used by people who either misunderstood the utility of archivers, spiders, and search engines, people with very fragile servers, people who wrote very fragile code, and people with something to hide. Most people either didn’t know about robots.txt or deliberately chose not to use it. This is retroactive oversensitivity, and amounts to a deletion of the past. Sure, it’s not “deleted”, but if I can’t access it, it might as well be. I’m still trying to sort out what is really happening (I can only guess until I hear back from the person at the archive who assured me they were fixing it)– his seems like a new approach by the IA, and if so, is backwards from the intent of the Oakland Policy, which is about having control over what is excluded from the archive, not a requirement for inclusion. Maricopa had a massive security breach in 2013. Might have something to do with your issue. Ed Kelty is the head of IT for the District. Call Ed.